Almost four years ago, I documented a really cool vSAN capability here and here, which demonstrates how to bootstrap a vSAN datastore onto a single ESXi host. This powerful capability, which was by design, enables customers to easily standup new infrastructure including the vCenter Server Appliance (VCSA) in a pure greenfield environment where you only had bare-metal hardware to start with and no existing vCenter Server. As you can probably guess, I am a huge advocate for this capability and I think it enables some really interesting use cases for being able to quickly and easily stand up a complete vSphere environment without having to rely on an external storage array or playing games with Storage vMotion'ing the VCSA between local VMFS and the vSAN datastore for initial provisioning. Over time, this vSAN capability has gone mainstream not only from a customer standpoint but also internal to VMware. In fact, the use of this feature has made its way into several VMware implementations including but not limited to VMware Validated Designs (VVD), VxRail, VMware Cloud Foundation (VCF) and even in the upcoming VMware Cloud on AWS. This really goes to show how useful and critical of a feature this has become for standing up brand new VMware infrastructure which runs on top of vSAN. Huge thanks goes out to the original vSAN Architects who had envisioned such use cases and designed vSAN to include this functionality natively within the product and not have to rely or depend on vCenter Server. Just wanted to give folks a heads up on an issue that a colleague of mines recently identified when provisioning Virtual Appliances (OVF/OVA) onto a VSAN datastore when using the vSphere Web Client. He found that regardless of the VSAN Storage Policy that was selected, whether it is the default VSAN Storage Policy or a custom one, the Virtual Appliance will always be Thick provisioned. This behavior only occurs when using the vSphere Web Client and is not observed when using either the vSphere C# Client or the ovftool CLI. My understanding of the issue is that there are two ways in which a VM can get provisioned as Thin. The "old" method which was to explicitly specify the disk allocation type (Thin vs Thick) and the "new" method which uses VM Storage Policies. To ensure that we maintain backwards compatibility for older clients, if a client specifies Thick provisioned, it would actually override the VM Storage Policy even if the Object Space Reservation capability was set to 0 (Thin provisioned). Since you can no longer specify the disk allocation type in the vSphere Web Client, the default behavior is to not Thin provision and hence the current Thick provisioning result even though the default VSAN Storage Policy has OSR set to 0. Note: When referring to Thick provisioned in VSAN (proportionalCapacity = 100), It is defined as provisioned Thin with a reservation so there is a guarantee that space is available for the object. It is not accurate to compare this to Zeroed Thick or Eager Zeroed Thick in the VMFS/NFS world as VSAN is an Object Store. Engineering has already been engaged and is currently investigating the issue. We have also asked for a VMware KB to be published, so hopefully once that goes up, folks can subscribe to that for more details and updates. 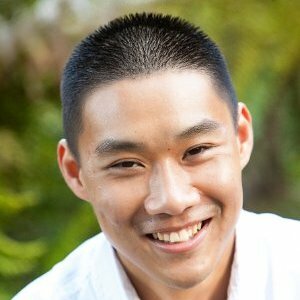 In the meantime, since it is actually pretty difficult to see if you have been affected by issue, I have created a simple PowerCLI script called Get-VSANPolicy.ps1 which will allow you to quickly scan through your VM(s) to identify whether you have any VMs that have been Thick provision residing on a VSAN Datastore. 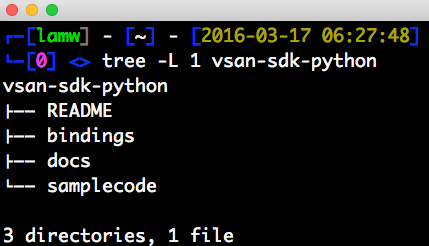 You can either get all VMs by piping Get-VM * or a specific set of VMs into the script. The following example retrieves all VMs that start with "Photon-Deployed-From-*" and extracts their current VSAN VM Storage Policy for both VM Home and individual VMDKs. Here, we can see that both VMs are using the default VSAN VM Storage Policy. Get-VM "Photon-Deployed-From-*" | Get-VSANPolicy -datastore "vsanDatastore"
Lets now only search for VMs that have been Thick provisioned by using the -thick option and setting that to true. Here we can see that the OVF we provisioned through the vSphere Web Client is the only VM listed. If we want to get more details on the underlying VM Storage Policy that was applied, we can also specify the -details option to true. Here we can clearly see that the 2nd VM has proportionalCapacity=100 which means Thick provision. 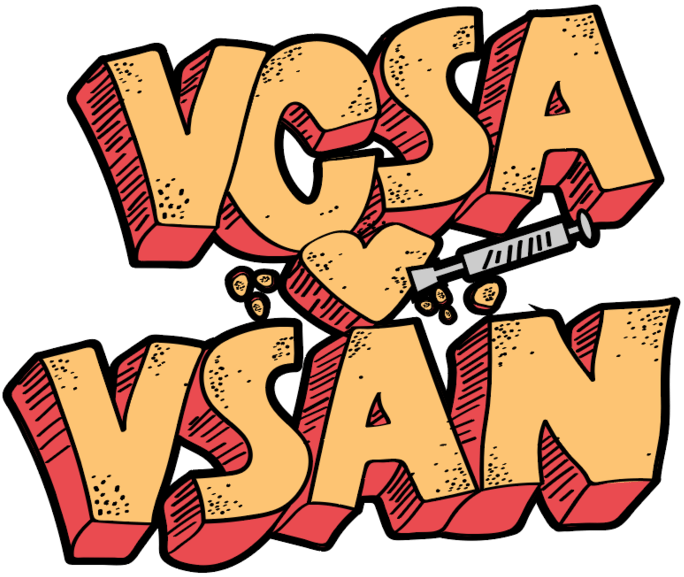 Luckily, the fix is quite easy thanks to Paudie O'Riordan who found out that it was as simple as just re-applying the VSAN VM Storage Policy! (Policy Based Management FTW!) This means there is no need to perform unnecessary Storage vMotions to be able to convert the VM from Thick to Thin, it is literally a couple of clicks in the UI. 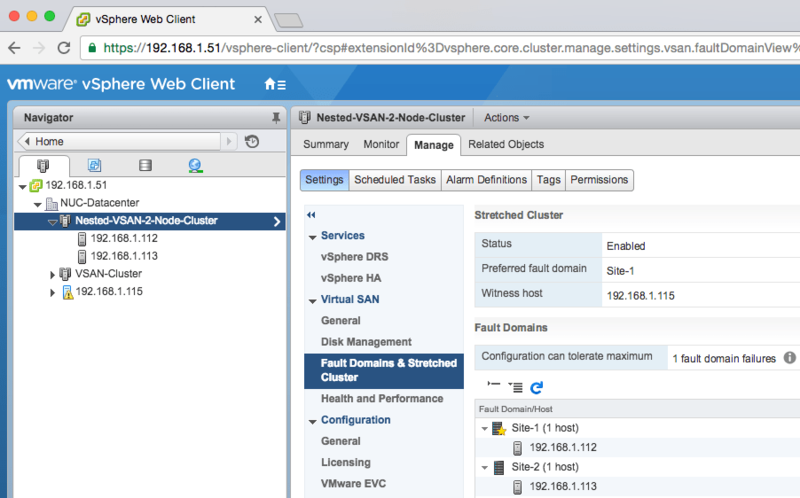 UPDATE (07/15/16) - Thanks to reader Jose, it looks like using the vSphere Web Client to re-apply the VSAN VM Storage Policy will correctly apply the policy to the VM/VMDKs, but does not reclaim the underlying storage. It is recommended that you use the PowerCLI script below to re-apply the policy which will then properly reclaim the underlying storage and will properly reflect the storage utilization. As with anything, I still prefer Automation and with that, I have created a secondary script to help with the remediation. This is also a PowerCLI script called Set-VSANPolicy.ps1 which accepts a list of VMs and the name of the VSAN VM Storage Policy that you wish to re-apply. If you now re-run the first script, you should see that you no longer have VMs that are provisioned Thick anymore (this may take some time depending on the size of your VMs). With the release of VSAN 6.2 (vSphere 6.0 Update 2), a new VSAN Management API has been introduced which covers all aspects of VSAN functionality including: complete lifecycle (install, upgrade, patch), monitoring (including VSAN Observer capabilities), configuration and troubleshooting. Although there is a well documented VSAN Management API Reference Guide which you can navigate around, I personally find it useful to be able to have a quick reference to all the APIs in on place which I can easily search and reference. This is especially true when I am learning about a new API. 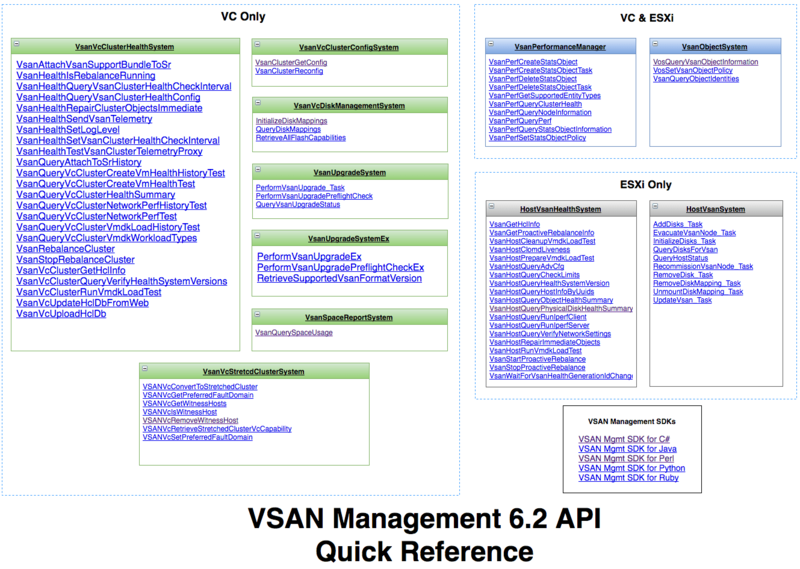 With that, I have created a "Quick Reference" of the new VSAN 6.2 Management API. You can find a screenshot below as well as the direct link to the quick reference. I used Draw.io to create the diagram but it is not just a static image of all the new Managed Objects and their respective methods, but each API method also links back to the VSAN Management API Reference Guide and best of all, because it is in HTML, you can easily search in the quick reference itself. I initially had created this for myself, but I figure that others could also benefit. I am curious if others find this useful and whether we should have something like this as part of the official VSAN Management API Reference Guide?